She whispered the answer, as though she was feeding me the response that I already knew. “Spirit IS home,” she said. That sentence hooked me. That one concept changed my life: the idea that I might—that we all might—already know this Spirit life. I now wonder: who is it inside of each of us who knows more than we see. What is it that we all know, but that we forgot momentarily, in this physical life? This reality that she tells about—the immediacy of Spirit home—has become real for me, and important. So important that she and I wrote this book, to share it with you. I was convinced that when someone died they were gone, out of my life; that some ethereal version of them had seeped through an otherwise impenetrable curtain called “the veil.” It was a one-way journey for them; they couldn’t reach me now, any more than I could reach them. Then, one day I met Jackie, and all of these things changed. All of those beliefs—changed—in a session that lasted one hour. It was life-changing, and it still has continued shifting my life, both inner and outer. Sometimes I think about what has changed in my life since that session with Jackie. . . . . The session didn’t convince me of the reality that there is an afterlife. . . .But what has changed is that now I trust after-life. For one thing, I now imagine that it is fabulous. . . . I actually think that death is the creation of Love. A major message of the book is this: life IS. Life always IS, in present tense. Life doesn’t end at death. Rather, death is a transition to a truly more wonderful and exhilarating part of the journey. Another message of the book is that this Spirit reality happens for all of us; it isn’t only reserved for those who have died. This book is Jackie’s explanation of the Spirit world, and it is a huge privilege for me to share this part of Jackie and her work with you in this book. This book also tells the story, as I currently understand it, of how Spirit reality continues to shift all parts of my life. Jackie and I offer you this book in the strong hope that this book becomes your story—the story of how Spirit reality reaches us and touches all of our lives. Alive and Speaking is a book that does many things. It is a guide to how the Spirit world informs us and helps us live our lives more fully. It teaches readers how to begin to develop our own mediumship. It presents a thoughtful reflection and a fresh view on theological concepts that often lose their relevance. This book is for all of us who want to know what it means to stand on the edge of this life and the next by opening our faith to the experience of this Spirit world. It is a book infused with stories of hope, and wisdom. 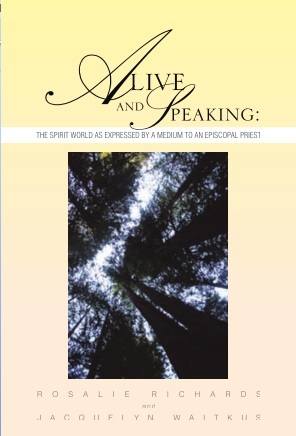 "… Easy and enjoyable to read, I recommend this book to anyone interested in the Spirit World"
I just finished reading my sister's new book, Alive and Speaking (by Rosalie Richards and Jacquelyn Waitkus). It is the story prompted my sister's coming to terms with my brother's death and in the context of her Christian path. Rosalie is an Episcopalian priest and Jacquelyn is a Medium. It is a fascinating story that makes both Christianity and the spiritual realm more accessible. Thanks for sharing, Joey. religion. It was not the usual medium autobiography. Nor is it a religious tract by an Episcopal priest. physical death and we can continue a relationship with those who have “gone home”. their presence in our lives. PAPERBACKS of Alive and Speaking are available for $10 with free shipping in the continental USA when ordered directly through this website. ----IF PAYING BY MONEY ORDER OR CHECK, put your name and email address on the contact page ask for payment instruction. EBOOKS are available through Lulu.com and Amazon.com. ----IF PAYING THROUGH PAYPAL, click the button below and follow the simple instructions. The Spirit series is a journey for each of us, and as you read this first book, you may have specific questions you want answered. Questions are important in this journey, and already thoughtful people have shared and asked for more insights and stories. Jackie and I are developing the next books in the Spirit series, and your questions are a part of this. Please send your questions through the comment section. We all on this journey together for a purpose.